We’d love your help. 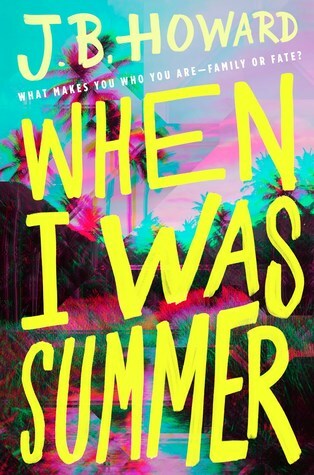 Let us know what’s wrong with this preview of When I Was Summer by J.B. Howard. A relatable novel about unrequited love, rock ’n’ roll, and what you find when you go searching for yourself. Sixteen-year-old Nora Wakelin has always felt like an outsider in her own family. Her parents and older sister love her, but they don’t understand anything about her: not her passion for music, not her all-encompassing crush on her bandmate Daniel (who is very much A relatable novel about unrequited love, rock ’n’ roll, and what you find when you go searching for yourself. To ask other readers questions about When I Was Summer, please sign up. This story follows Nora, an adoptive daughter, a talented bass guitarist, and is currently in love with someone who is in love with someone else. Along with her fellow band mates, she's on a road trip across the state to not only play music (and maybe even get scouted), but to find out information on her biological mother. With three stops for three gigs, and three addresses of potential parents, it's going to be a hectic week! In this contemporary adventure, Nora learns that love is not always a fairy tale, but also that she is stronger than she thought. Her development as a character was smooth but dynamic, and despite feeling more lost and confused than when she began, she never gave up. The writing style is easy to read, and the realistic challenges they face were well written too. This book is set to release pretty soon and I'm excited to hear other opinions about it! I feel like I had fairly high expectations, which is unusual for me and ARCs because it's so close to its release. Nora lives by music. She's in a band called Blue Miles with her three friends, Daniel, Cameron, and Flynn. She has a crush on Daniel but he's madly in love with his on-again, off-again girlfriend Darcy (who was honestly AWFUL). They embark on their first tour with the ultimate destination of the Magwitch, an amazing venue in good ol' San Francisco to sing with a HUGE band. Nora has received some clues about where her birth mother could be located and throughout the tour, they stop in places where she thinks she might find her mother (with the help of some fairly-deep and sorta-realistic sleuthing). The ending of this book is bittersweet and may not please readers (I was not entirely happy with it). However, the book sends readers on a wild ride with characters, romance, music, and the question of family and finding those who you belong to. I feel as if everybody has had some experience with not fitting in: Nora has never fit in with her Stanford-headed adopted family, which I think really helps her want to find her birth mother. Although her family is really good to her and helps her, she constantly talks about the fact that nobody understands her musical language. Her actual family is honestly a mess with fathers all over the place. It's a little bit crazy but I mean, I guess all families have a little mess in them. Nora learns that her mother initially called her Summer and I think that after a while, we understand that Nora and Summer are basically two different people, hence the title. I would recommend this book to readers looking for a middle-grade/young-adult novel about finding friends, love, and family.